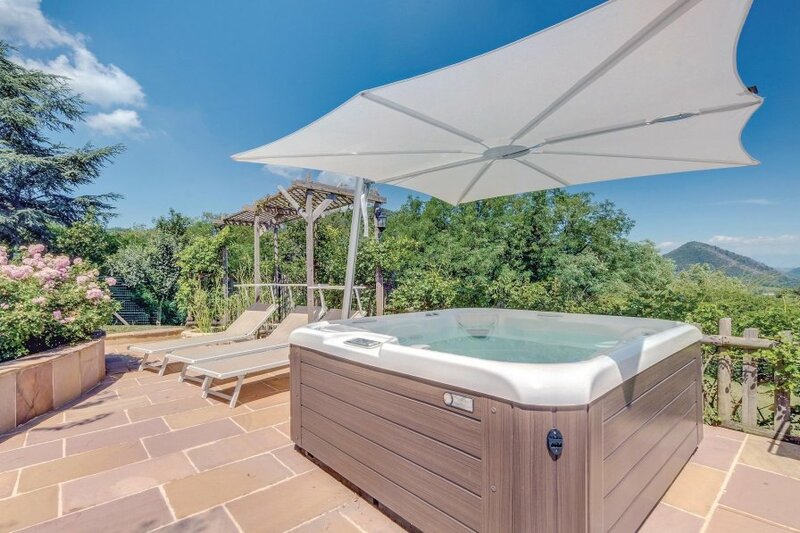 Lovely holiday villa deep in the green of the Euganean Hills, with whirlpool and large equipped outdoor terrace boasting a wonderful view over the towns of Padua and Abano Terme (6 Km). If you like the idea of ​​spending your holidays immersed in beatiful green, in contact with nature and making beautiful hikes, then this beautiful holiday villa near the Euganean Hills Park is the right place for you! Admire the splendid view over the town below and over the cities of Padua and Abano Terme, which you can also enjoy while relaxing in the comfortable Jacuzzi or dining on the large outdoor terrace at your disposal! The Euganean Hills Park is a true paradise for those who wish to take a break from the stressful daily routine! Trails in the woods, passable on foot and by bicycle, but also adventure parks equipped with paths and tree climbing, rest areas equipped with tables and barbecues for pleasant picnics, as well as the possibility of visiting characteristic medieval villages such as Arquà Petrarca, Monselice, Este and Montagnana will give you pleasant moments to spend with your loved ones and which will remain in your memory for a long time! For a relaxing day we also recommend a visit to the thermal centers of Abano and Montegrotto Terme, just 6 km from here, famous for their mud therapies. For those who love to play golf, there are several courses nearby where you can practice this sport. The property is also a convenient starting point to reach the main art cities of the Veneto: the charming city of Venice (70 km) with its canals and architectural masterpieces can also be reached by train from the nearby railway station (6 km); Padua with the beautiful Scrovegni Chapel with Giotto's frescoes is just 10 km away; Vicenza with its beautiful Palladian architecture is 40 km away; Verona with Juliet's famous balcony and the beautiful Arena, venue for concerts (from opera to pop) during the summer season is 80 km away. For the joy of adults and children, about 100 km is Lake Garda with its amusement parks.Not to forget is the rich gastronomic offer of the area with wine cellars and restaurants where you can taste the excellent wines and local specialties." This beautiful villa is made from brick or stone and was originally built in 1800 and refurbished in 2016. The agent has rated it as a four star property so it is a well-equipped villa with above average furnishings. It is also great value for money. This villa has view over the landscape; it is also only 3km from Torreglia. It is set in a good location: there is a restaurant 1km away.